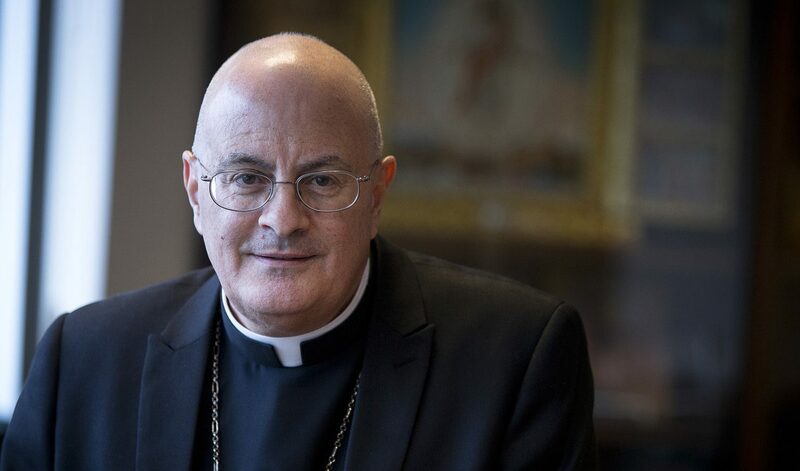 WASHINGTON (CNS) — The humanitarian work of Catholic Relief Services and its partner agencies directed toward refugees in the Middle East deserves far more attention than it has received and Maronite Bishop Gregory J. Mansour says it’s time Catholics in the pew know about it. The work of feeding, sheltering and providing health care for hundreds of thousands of people who have trekked to safety in Jordan and Lebanon from Iraq and Syria is a story that the mainstream media largely has ignored, much to the chagrin of Bishop Mansour, the incoming chairman of the board at CRS. In a Dec. 16 interview with Catholic News Service, he said that the focus of much media reporting has been on assessing blame for the catastrophe or analyzing the response of governments in the region with little attention paid to the plight of the people uprooted from their homes. Bishop Mansour heads the Eparchy of St. Maron in Brooklyn, New York, which includes Maronite Catholics in the District of Columbia and 16 states. It is one of two Maronite eparchies in the U.S. The Maronite Catholic Church is a worldwide Eastern Catholic Church that traces its roots to a fourth-century Syrian monk named Maron. Bishop Mansour critiqued the media for focusing blame and then doing nothing in the way of solutions. “Pope Francis got it right: The media people, many of them just antagonize, make the situation worse. They’re not doing what CRS is doing on the ground. They’re not doing what Caritas (is doing). They’re not doing what the Catholic Church is doing,” he said. The Maronite leader has been an outspoken advocate for persecuted Christians and other religious and ethnic minorities in the Middle East for years. He has visited Lebanon since the 1980s and Jordan and Egypt more recently. At the U.S. Conference of Catholic Bishops’ fall general assembly in Baltimore in November, he called on his brother bishops to focus greater attention to the plight of persecuted Christians in the region. However, he explained to CNS that he has kept his advocacy for the rights of persecuted people separate from his role as a CRS board member since 2012 and promoting a purely humanitarian response to people in need. Even so, he sees both as equally important. “I’d like to do the advocacy outside of CRS so that the American government can play a pivotal role, not be in loggerheads with Russia, but to work with Russia to resolve the issues. … Syria is a man-made disaster and man can undo it with a bit of effort,” he said. The U.S. bishops’ overseas development and relief agency’s work around the world is often carried out in collaboration with members of the church’s worldwide network of Caritas humanitarian agencies. Its work often focuses on leveraging its expertise in helping local agencies develop their capacity to take on the work the Baltimore-based agency has done. Bishop Mansour cited CRS’ support of Adyan in Lebanon as an example. Adyan, an Arabic word meaning religions, was formed by a Maronite priest and Sunni Muslim woman and a team of staffers and volunteers. Adyan’s work led Lebanon to declare a joint Christian-Muslim holiday, observed March 25, the feast of the Annunciation. Bishop Mansour described the day as the only one of its kind in the world. It allows Muslims and Christians, young and old, “to find a common interest in humanitarian, in cultural and in religious dialogue,” he said. It’s not only the Middle East where CRS’ work is making a difference. Bishop Mansour wants to make sure Catholics in U.S. parishes who contribute to the agency understand the positive results of its work. He cited, for example, the positive results of “impact investing” that would loan a small sum of money to a man knowledgeable about car repair so he can obtain the tools necessary to open a business in his town, or allows a poor family to buy equipment to make cheese from the milk of goats they own so they can sell the product at local markets. Bishop Mansour noted that CRS also receives funding from the U.S. Agency for International Development as well as other humanitarian and development organizations. He stressed that any work CRS carries out falls in line with Catholic teaching. “We deal in a very tough neighborhood,” he told CNS. “We work with 1,100 different relationships with different groups, and sometimes we get guilt by association because we’re buying mosquito nets from someone that we really disagree with. Or we’re working with USAID that has a very different objective than we do.